Dr. Chris Stevens treats gum recession and periodontal disease in Madison, WI using a variety of current techniques and technology. Call us today to arrange your consultation. Receding gums occur when soft tissue deteriorates to the point that the tooth roots are exposed, which can cause inflammation, temperature sensitivity, and discomfort. Patients with receding gums in the Columbus, WI area often find out that periodontal disease is to blame. Periodontal disease is a progressive infection caused by bacteria between the teeth and gums that requires professional treatment right away. Gum recession can be a result of several different factors, but for many people it is a sign of periodontal disease and can become worse without treatment. Dr. Stevens uses different techniques and technologies to address periodontal disease and gum recession so that teeth and gums are healthy and more attractive. 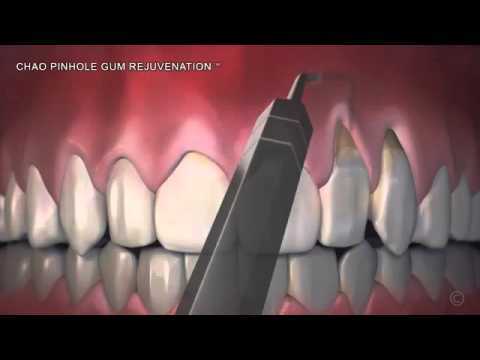 A consultation and exam with Dr. Stevens will enable him to determine what type of gum surgery is suitable, either a conventional gum grafting procedure or the minimally invasive Pinhole Surgical Technique (PST™). Our staff will also try to determine why you have gum recession and may be able to offer tips for preventing further damage. Something as simple as changing the way you brush can stop further gum recession and help prevent periodontal disease. For patients who do have periodontal disease, Dr. Stevens can treat it with the most current technologies and treatments, including laser dentistry or a scaling and root planing procedure, depending on your situation. Gum recession should never be ignored. If you have receding gums, it is important to find out why. Gum recession could be the result of periodontal disease, a condition that will only become worse without treatment and place your gums, teeth, and bone at serious risk.